On the heels of Germany’s Poul Zellmann ‘s solid performance in the men’s 200m free, which you can read more about here, Sweden’s Sarah Sjostrom did her usual damage in the women’s 100m fly to bring her gold total to 3 over just 2 days here in Stockholm. 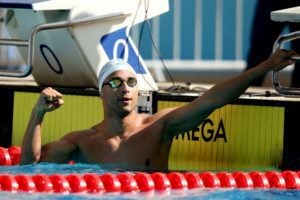 The multi-Olympic medalist took the 200m free/50m fly double last night with times of 1:55.29 and 25.34, respectively, and the 25-year-old roped in the 100m fly tonight in a mark of 56.69. That was enough to clear the field by over a second, with Germany’s Angelina Kohler clocking 57.85 for silver, while Denmark’s Emilie Beckmann took bronze in 58.77. For Sjostrom, her time checks-in as the Swede’s season-best, overtaking the 56.86 she produced at the Bergen Swim Festival. Her outing tonight also now moves Sjostrom into the number one spot on the season’s world rankings, overtaking the 56.85 owned by Australian Emma McKeon from this week’s Australian National Championships. Kohler’s mark also slides into the world rankings, representing the German’s season-best and the 13th fastest in the world. For Beckmann, her mark falls shy of the qualifying time needed for Gwangju, as this meet is another selection meet for Danish swimmers. Her time tonight of 58.77 needed to have been .25 faster to met the 58.48 QT. 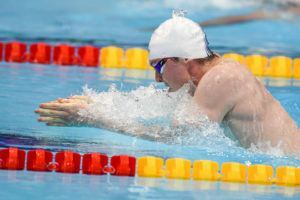 On-fire Tobias Bjerg of Denmark proved that his 2 sub-1:00 100m breaststroke times were anything but a fluke, as the Dane produced yet another speedy performance this evening. Bjerg clocked a winning time of 59.50 to beat the field in the only time under a minute, checking with a new meet record in the process. Bjerg became the fastest man ever in Denmark and the nation’s first-ever sub-minute 100m breaststroker with his 59.17 from last week’s Danish Open. Runner-up status in tonight’s race went to Fabian Schwingenschlogl, who hit the wall in 1:00.11, while Lithuanian Giedrus Titenis, the 200m breast bronze medalist from way back at the 2009 World Championships, rounded out the top 3 in 1:00.33. Katinka Hosszu produced another dominating performance in her pet 400m IM event, winning by over 13 seconds. Clocking her fastest mark of the season, Hosszu clinched the meet title in a new competition record of 4:33.06. Her result outperformed her previous season-best of 4:33.83 from Marseille and inches the Iron Lady closer to the world leader Yui Ohashi of Japan. Hosszu’s time would have won the 2018 European title by about half a second, for perspective. Germany’s Franziska Hentke took silver in 4:46.25, while Katrine Bukh Villesen touched in 4:46.52 for bronze in the race. Hosszu was right back at it in the women’s 100m back, winning the event in a new meet record time of 59.95. Germany’s Laura Riedemann was shortly behind in 1:00.30, while Sweden’s Michelle Coleman took bronze in 1:00.44. Florian Wellbrock of German wowed the crowd with a showstopper in the men’s 1500m freestyle. Stopping the clock in a speedy 14:42.91, the 21-year-old Olympian registered his fastest time of the season. 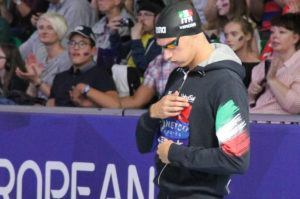 He now inserts himself into the world rankings list this season as the #2 swimmer, sitting only behind Olympic champion Gregorio Paltrinieri of Italy. Wellbrock is the defending European Champion in this grueling freestyle event, having clinched the title in Glasgow with a German National Record of 14:36.15. Behind Wellbrock this evening was Jan Micka who produced a mark of 14:48.52 for silver, while Henrik Christiansen hit the wall in 14:49.67 for bronze. These two racers also notched season-bests, moving into the top 5 in the world in respective slots of 3rd and 4th. Micka’s mark now checks-in as a new Czech National Record, as does Christiansen’s. Look for separate posts on their historic swims. Norway’s Tomoe Hvas turned out a new National Record in the men’s 100m butterfly, taking the gold in 52.46. Germany’s Ramon Klenz was next in 52.63, while Israel’s Tomer Frankel logged 52.87 for 3rd place tonight. 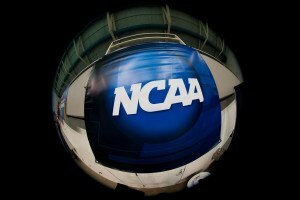 Look for a subsequent post on Hvas’ national record-breaking effort. Finland’s Ida Hulkko snared the women’s 50m back win in 30.82, while Christian Diener got the win in the men’s edition in 25.05, a new meet record. Oh, I really miss Rikako Ikee – may she get well real soon. I hope the fact that 24.9 and 55.9 will be enough to win in the butterfly this year, but that it’ll probably take 23.6 and 51.9 to win in the freestyle isn’t lost on sjostrom. Titenis didn’t win bronze in Rio. I don’t think he even made the semis. Baladin, Prenot and Chupkov. Brain lapse, sorry – 2009 Worlds. Big difference!